Tucson Daily Photo ~: Wow Owl! 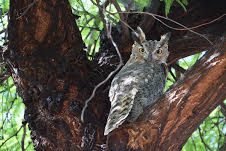 Imagine looking up in your backyard and seeing this beautiful owl resting in your tree! Wow! Absolutely gorgeous!